FAREED ZAKARIA, (CNN) The midterm election results were just one more reflection of the pervasive discontent in the United States these days. Two-thirds of Americans believe the country is on the wrong track, and yet if one looks at the rest of the world, what’s striking is how well the United States is doing relative to other major economies. President Obama says the United States has produced more jobs in its recovery than the rest of the industrialized world put together. Why is this? Many believe the American economy has some inherent advantages over its major competitors, a more flexible structure, stronger entrepreneurial traditions, a more demographically dynamic society. Well, along comes a fascinating new book that says you ain’t seen nothing yet. Peter Zeihan’s “The Accidental Super Power” begins with geography, pointing out that America is the world’s largest consumer market for a reason — rivers. Transporting goods by water, he points out, is 12 times cheaper than by land which is why civilizations have always flourished around rivers. And America, Zeihan calculates, has more navigable waterways, 17,600 miles worth, than the rest of the world put together. By comparison, he notes, China and Germany have about 2,000 miles each, and all of the Arab world has just 120 miles of river. But that’s just the beginning. The world’s greatest river network directly overlies the world’s largest piece of Arable land, the American Midwest, he writes. Add to this America’s many and unequal deep water ports which you need in order to get goods to and from the rest of the world. Chesapeake Bay alone boasts longer stretches of prime port property than the entire continental coast of Asia from Vladivostok to Lahore, writes Zeihan. All of these factors combined have created the world’s largest consumer market, surplus savings and a dynamic unified economy. It’s also remarkably self-sufficient. Imports made up 17 percent of the American economy in 2012 according to the World Bank. Compare that to Germany’s 46 percent or China’s 25 percent. And this number in the U.S. will fall as America imports less and less foreign oil. Zeihan emphasizes the degree to which America’s energy revolution has insulated it from the rest of the world. Thanks to efforts to extract shale, North America has much of the energy it needs at home. As the world gets messier, he argues, there are fewer and fewer compelling reasons for America to pay blood and treasure to stabilize it. I’m not as sure as Zeihan that America’s advantages are simply structural. If one looks at the last five years, again in comparative terms, American public policy actually comes out looking impressive. To combat the global economic crisis of 2008, Washington acted speedily and creatively on three fronts, aggressive monetary policy, fiscal policy, and reform and recapitalization of the banking sector. Every other rich country did less and has seen a more troubled return to normalcy. Now since the response to the crisis, Washington has been paralyzed and polarized, but this is not the entirety of American politics. Beyond the beltway, mayors and governors are reaching across party lines partnering with the private sector and making reforms and investments for future growth. When Tocqueville wrote about America in the 1830s he was struck by the bottom up vitality of its towns and villages. So as we approach Thanksgiving, let’s bear in mind that the genius of America is still alive, whatever most Americans might think. I just got back from doing my local music radio show on internet only Wbkm Dot Org, and seeing music at Club Metronome. Much like Blue Button I started and ended classic and threw some new songs in the middle. From our small city to the great big world, these are the Sounds of Burlington. It’s a cold night in Burlington and it’s making me want the comfort of come classics. Here are some spy songs to get us going. This is Opium Spy Thriller by Ninja Custodian on WBKM, and this is Burlington’s kind of music. I loved seeing Blotto at Hunt’s. All three bands used to play in the ’80’s in Burlington. It’s cold, and one of the best ways to warm up is to burn something. This band is likely playing right now at Club Metronome. The best ways to stay warm in a Vermont winter are to burn something, or go somewhere warm like California. OK, on to the next song on Lipstick and Dynamite. Rough Francis have a couple of birthday shows coming up in early December at Radio Bean. Blue Button are playing with Phil Yates and Dino Bravo VT at Metronome tonight. I keep missing shows by this next band and will have to cure that soon. I love these three as one piece. Love the music and the deep thinking lyrics. This next guy has some great lyrics too. Vetica have broken up and have a new album coming out soon. I can’t wait! Wave are so much fun, and I love the lyrical tie in with Jeremy. 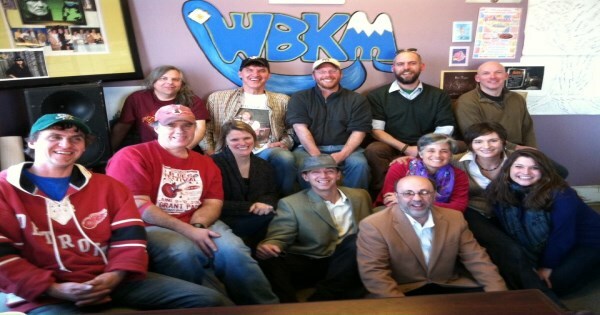 The WBKM birthday party at Nectar’s last Saturday was a blast. These guys were amazing. Book ‘Em played a killer version of that Frank Zappa song at the birthday show. Seth and the band were amazing doing a Neil Young set, and the Kind Buds were just phenomenal. This next song is one of the great songs to come out of this town recently. Great new song from the digital release of the Claws album. Thanks Cush for the killer shows at Arts Riot and Radio Bean!! Hmm, Swale. That was all new, so let’s end classic. I love this song. I hope you enjoyed checking out the music of our town. Next week is Thanksgiving but we can check it out again the week after. FAREED ZAKARIA, CNN HOST: But first here is my take. As Moscow continues to send its forces into Ukraine, it seems clear that Putin’s Russia presents America and the West with a frontal challenge. But in the longer run, it is not Russia’s overt military assault, but China’s patient and steady nonmilitary moves that might prove the greater challenge. Russia is a great power in decline. Its economy amounts to just 3.4 percent of global GDP. China’s is nearly 16 percent and rising. Now almost four times the size of Japan’s and five times that of Germany’s according to the World Bank. Presidents Obama and Xi deserve the accolades they are receiving for their historic agreement on climate change and it seems to suggest that America and China are moving toward a new, productive relationship. Except that even while signing these accords, Xi Jinping’s government has been taking steps that suggests it is developing a very different approach to its foreign policy, one that seeks to replace the American-built post-1945 international system with its own. If it continues down this path, it would constitute the most significant and dangerous shift in international politics since the end of the Cold War. It’s been widely reported that Xi has presided over a rise in nationalist rhetoric in recent years, much of it anti- American. While nationalism has been circulating in China for a while, the quantity seems to have risen sharply. One count done by the “Christian Science Monitor, found that the number of anti-western polemics in the official “People’s Daily” in 2014 so far has tripled compared with the same period last year. Perhaps more important, however, is that China has begun a low-key but persistent campaign to propose alternatives to the existing structure of international arrangements in Asia and beyond. It’s moved from being anti-American to post-American. This summer Beijing spearheaded an agreement with the other BRICS countries to create a financial fund that would challenge the IMF. In October Beijing launched a $50 billion Asian infrastructure bank explicitly as an alternative to the World Bank. And last year President Xi declared that China would spend $40 billion to revive the old silk road to promote trade and development in that region. For China to fit into an international system rubs against its deepest historical traditions. In his recent book Henry Kissinger notes that China has never been comfortable with the idea of a global system of equal states. Historically China considered itself in a sense the sole sovereign government of the whole world. Diplomacy was a series of carefully contrived ceremonies in which foreign societies were given the opportunity to affirm their assigned place in the global hierarchy. One in which China sat on top. These are worrying signs not because Beijing’s efforts will surely succeed. They may not. Many of its efforts have run into opposition, but if China continues down this path using its growing clout to ask countries to choose between the existing set of arrangements or new ones, it might create conditions for a new kind of cold war in Asia. It will certainly help to undermine and perhaps eventually destroy the current international order, one that was created by the United States after 1945 and which has been a platform on which peace and prosperity have flourished in Asia for seven decades.